Documentary Looks Past The Stereotypes In 'Monrovia, Indiana' Documentarian Frederick Wiseman aims his camera at the daily rhythms of life in and around a small town — and holds his focus long enough to find something beyond media stereotypes. 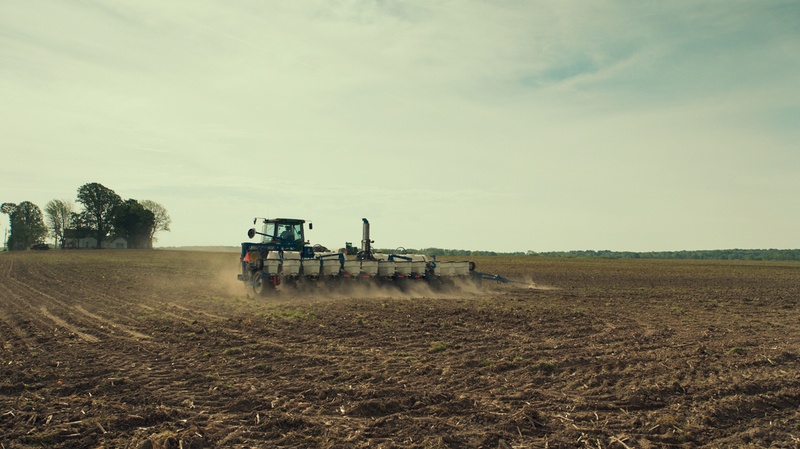 Farm Wisdom: Noted documentarian Frederick Wiseman's latest film examines contemporary life in and around Monrovia, Indiana. Since Donald Trump was elected president, there's been a pandemic of newspaper pieces in which a reporter sits down at a Midwest diner, polls a gaggle of older white voters about the latest Trump provocation, and comes away with the not-so-shocking conclusion that they're still in firm support. What's missing from these drive-by features is any deeper sense of how its subjects actually live or how they interact with their communities, so they're defined entirely by their red-state intransigence. They're Red State Man or Red State Woman, faceless stakeholders in a simplified political landscape. The name Donald Trump never comes up in Monrovia, Indiana, the latest documentary from Frederick Wiseman, the 88-year-old master of observational filmmaking. Though Wiseman drops anchor in a conservative rural area — the county, just southwest of Indianapolis, went 75% to 19% for Trump — there's not much explicit political chatter, outside of a laugh over the inadvertent use of the word "collusion" and festival t-shirts with slogans like, "Work Harder: Millions On Welfare Depend On You." It's possible to read into the culture of the place — Wiseman's style has always encouraged it, in fact — but the film plays like a gentle rebuke to those Red State Man pieces, insisting that there's more dimension to an American small town than we're used to seeing. In certain respects, Monrovia, Indiana feels like the natural flip-side to In Jackson Heights, Wiseman's vibrant 2015 portrait of the diverse communities that reside in the same neighborhood in Queens, New York. The denizens of Monrovia are not-at-all diverse and a word like "vibrant" would never apply to its population, which trends older and, based on the city council meetings chronicled here, resists an influx of new residents. It's also a Midwest companion to Wiseman's four-hour 1999 epic Belfast, Maine, about the beauty and dysfunction of a seaside town with its own white, working-class core. At a relatively breezy 143 minutes, his new film seems initially slight, quietly drinking in the golden splendor of the landscape and the day-to-day rituals of local businesses. Yet Wiseman builds toward something special. From the beginning of his fifty-year career, Wiseman's direct cinema style, more popularly understood as "fly-on-the-wall," has sought to understand society through its institutions, reflected in titles like High School, Public Housing, and his last feature, Ex Libris: The New York Public Library. Here he camps out at city council meetings, where public officials discuss issues like a troublesome development called Homestead, and spends plenty of time at the church for a wedding, a funeral and a roundtable with parishioners. Yet Wiseman isn't interested in the city's power centers so much as the rhythms of everyday life, governed by satisfying ritual. Wiseman's camera hangs out at local businesses like Hot Rod's Barber Shop, which keeps the town's men in buzz cuts, and witnesses the construction of pepperoni-stuffed breadsticks at Dawg House Pizza. It descends on the high-school gymnasium, which at various times is converted into a mattress sale center and the site of a tuneless middle-school band rendition of The Simpsons theme. When a Freemason gets his 50-year gold award, Wiseman is at the Masonic Lodge soaking in every word of the ceremony. He'll accept some stretches of mundanity to get a fuller sense of who people are, and he has a senior citizen's indulgence of a good salesperson, like a hemp oil proselytizer or a mattress man who graphically demonstrates the sweat and dead skin that accumulates while we sleep. Monrovia, Indiana lopes along pleasingly, if a bit too casually, with nothing more dramatic than Homestead resident complaining about the fire hydrants that serve a strictly ornamental purpose in his neighborhood. But Wiseman has made a sneakily death-haunted film, subtly emphasizing the older residents of the town before ending explicitly with funeral rites. It's hard to think of a Wiseman film as personal, given his formal discipline, but he has the end on his mind here and seems to appreciate how the townspeople ease their own into the next life. It'd be the perfect career-capper — if he were the type to ever call it a career.